A care home assistant who led a life of luxury thanks to an £8million mortgage fraud sobbed as she was jailed for four years on Wednesday 24th March, 2010. 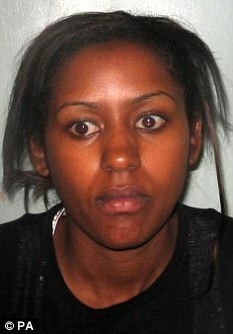 Ruth Ayinde-Azeez, 26, lived in a six-bedroom mansion containing 12 plasma TVs and drove around in a top-of-the range Bentley and Land Rover. She took lavish holidays in Dubai and the south of France, kept £1.6m in her bank accounts and blew huge sums at upmarket bars and restaurants. But her lifestyle was funded by crime, Southwark Crown Court heard. Her husband Victor, a fraudster who is on the run overseas, led a mortgage con gang which plundered nearly £6m from high street banks in just six weeks using a network of front companies and crooked solicitors. The court heard that Ruth Ayinde-Azeez was sucked into the criminal world of her husband and came to enjoy the trappings of excessive wealth. The Kenyan national laundered £1.25million and was jailed today for four years for her part in the fraud. Mrs Ayinde-Azeez, of Barnet, was found guilty at trial last month of conspiracy to acquire, use or have criminal property and removing criminal property. During the trial, the jury heard that when she was arrested, she had loaded her car and was about to flee the country. Judge Anthony Beddoe told former care home worker Ruth: ‘I do accept that you got sucked into the dishonesty of your husband, and it may be that had you never met, you would never have been in the position you are in, in this court. ‘But you are not, I am afraid, as naive as your counsel sought to suggest on your behalf to the jury. Three others who took part in the fraud were also sentenced. Isaac Matthews, 42, of Chatham, Kent, pleaded guilty to conspiracy to acquire, use or have criminal property and two counts of entering into an arrangement in relation to criminal proceeds. Describing him as a ‘seasoned fraudster’ the judge sentenced him to six years in jail. The court heard he had previously been sentenced to nine years in the US for fraud. Matthews used his sister, Anthonia Akinyele, 35, of the same address, to help launder the money through two companies. In total £5.2 million went through the companies, Zikkito and Isaac and Isaac International. The judge said: ‘I have no doubt you were to receive and were expecting to receive a very significant cut.’ Akinyele, who pleaded guilty to acquiring, using or having criminal property and two counts of entering into an arrangement in relation to criminal proceeds, will be sentenced later. Jason Mercer, 36,of Hemel Hempstead, Hertfordshire, pleaded guilty to conspiracy to acquire, use or have criminal property. The judge said Mercer, who obtained £111,000 to launder, conspired to play a part in the distribution of money being criminally obtained by Nigerian Victor Ayinde-Azeez and others and sentenced him to 21 months. David Hunter, 35, of Hemel Hempstead, pleaded guilty to conspiracy to defraud. The judge sentenced him to three years and nine months in jail, saying he was responsible for losses of £1.5 million after lending his name to four fraudulent mortgage applications. The court heard that 24 fraudulent mortgage applications were successfully made between June and December 2007. This entry was posted on March 24, 2010 at 6:45 PM	and is filed under Diaspora News. You can follow any responses to this entry through the RSS 2.0 feed. Both comments and pings are currently closed.